WASHINGTON, DC — New legislation aimed at updating one of the nation’s foundational hunting and angling programs will strengthen wildlife management and conservation across the United States. The National Wildlife Federation urged Congress to swiftly enact the Pittman-Robertson Modernization Act. The legislation, introduced by Congressman Austin Scott, Republican of Georgia, and colleagues, would support important programs to recruit, retain, and reactivate hunters by allowing Pittman-Robertson hunter education funds to be used for hunter outreach and recruitment programs as well. Former Interior Secretary Ken Salazar joined Collin O’Mara, the National Wildlife Federation’s CEO and president, and business and conservation leaders Thursday to speak out for conserving America’s public lands and against attempts to sell or get rid of the lands that sustain fish and wildlife populations as well as hunting, fishing and the country’s multi-billion-dollar outdoor recreation industry. The National Wildlife Federation’s 49 state affiliates have unanimously approved a resolution that calls for keeping public lands in public hands and opposes large-scale exchanges, sales or giveaways of federally managed lands. This week, 41 of the state affiliates sent a letter to the Republican National Committee asking that it rescind a resolution adopted this year that urges Congress to turn over public lands to the Western states that want them. The affiliates noted that public lands help grow America’s economy by supporting an outdoor recreation industry that generates $646 billion in economic benefit annually and supports 6.1 million jobs. The organizations stressed that wise stewardship of the lands that belong to all Americans is a long tradition that cuts across political and social lines. “Despite the economic importance of federal lands to wildlife and people, they remain under constant threat. In recent years, several state legislative proposals have called on the federal government to transfer ownership of public lands to the states, which in turn would pass them off to private interests in many instances,” the organizations wrote. The Interior Department’s latest annual economic report shows the agency’s programs and activities generated $360 billion in benefits and supported more than 2 million jobs nationwide in fiscal 2013. Former Interior Secretary Ken Salazar started preparing the reports in 2009 to highlight the department’s contributions to the U.S. economy. “The nation’s public lands are the birthright and priceless heritage of all Americans. Our policymakers and elected leaders should be working to preserve and enhance these multiple use economic engines,” said Salazar, who served as Interior secretary from 2009 to 2013. The National Wildlife Federation is on the front lines of conserving fish and wildlife and the places where they live, and in large part those places are public lands, O’Mara said. “The National Wildlife Federation, our 49 state affiliates, and four million members and supporters strongly support keeping our public lands in public hands. As a diverse federation of hunters, anglers, hikers, wildlife watchers, and nature lovers, we are united in our passion for protecting public lands, which provide amazing outdoor experiences for all Americans, landscapes for deer, elk, pronghorn, and bison herds to migrate, forests for grizzlies, bighorn sheep and lynx, and critical habitat for more than 700 species of birds, 220 species of mammals, 1,000 species of fish and 250 reptile and amphibian species. For more than a century, protecting land for the benefit all outdoor enthusiasts and wildlife has been an essential element of the American experience—and we must pass on this legacy to future generations,” O’Mara said. The wildlife federations have worked through the years to conserve the public lands necessary for fish and wildlife and hunting and fishing and will continue to do, said David Chadwick, Montana Wildlife Federation executive director. Surveys and polls show overwhelming support for public lands among voters in the West, the target of many of the drives to dispose of public land. That support extends beyond the region to other parts of the country where hunters, anglers and other wildlife enthusiasts enjoy the backcountry, rivers and forests, said Tim Gestwicki, the North Carolina Wildlife Federation CEO. “Sportsmen and women and wildlife watchers in the Southeast value our public lands, from the Appalachians to the coast. We also value the Western lands and their abundant wildlife, big open spaces and great hunting and fishing. We stand with our fellow sportsmen and women in defending public lands and protecting the special places that offer some of the best of what this country is about,” Gestwicki said. “Sportsmen are on the front line in this effort to prevent the transfer of federal public lands. These are the very lands where we hunt and fish, and where we pass on those traditions to our kids. The idea that somehow our federal public lands are dispensable is an affront to all hunters and anglers, and we are determined to protect these lands for ourselves and for future generations,” said Garrett VeneKlasen, executive director of the New Mexico Wildlife Federation. America’s national parks, monuments and rugged landscapes are not only a draw for people in this country, but across the world, said Peter Metcalf, CEO and president of Black Diamond, Inc., a leading manufacturer of outdoor sports equipment and clothing. National Wildlife Federation affiliates’ resolution on transfer of public lands. NWF affiliates’ letter on transfer, sale of public lands. Rising temperatures, deeper droughts and more extreme weather events fueled by manmade climate change are making survival more challenging for America’s treasured big game wildlife from coast to coast, according to a new report from the National Wildlife Federation. Nowhere to Run: Big Game Wildlife in a Warming World details how climate change is already putting many species of big game at risk, creating an uncertain future for big game and the outdoor economy that depends on them. Wildfire, floods and extreme weather events like heat waves, droughts and heavy rainfall, are becoming more frequent and more severe. Unprecedented changes in habitat are having far-reaching consequences for big game and for sportsmen and women, affecting, for example, the timing of hunting seasons and the distribution and survival of animals. · Heat: Moose can become heat-stressed in warm weather, especially in summer if temperatures climb above 60 to70 degrees when moose coats are thinner. Heat stress leads to lower weights, declining pregnancy rates and increased vulnerability to predators and disease. Because of warmer fall and winter temperatures, black bears are already more active than usual during times when they normally conserve energy through hibernation, pushing fat stores to the limit. · Drought: More droughts have reduced aspen forests in the west, a favorite elk habitat, and many elk are not migrating as much as they traditionally have. Increasing periods of drought, more invasive plants and wildfires will alter sagebrush and grassland ecosystems, favored pronghorn habitats. · Parasites and disease: With less snowpack to kill ticks, moose in New Hampshire are literally being eaten alive, losing so much blood to ticks that they die of anemia. 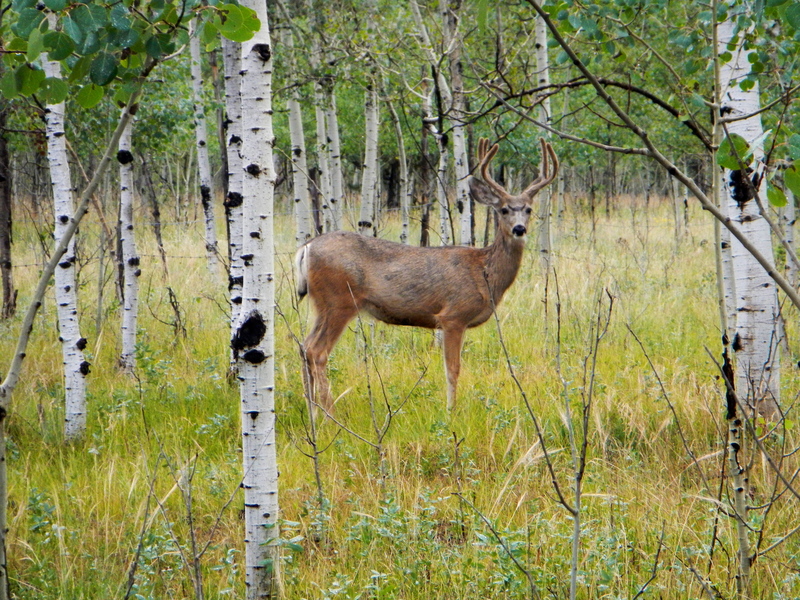 White-tailed deer are susceptible to hemorrhagic disease caused by viruses transmitted by biting midges. In 2011, there were more than 12 million adult big game hunters who spent more than $16 billion on hunting. More than 22 million people observed big game near their homes and 10 million traveled to view big game. Sportsmen have invested decades and millions of dollars in restoring big game habitats and populations, in excise taxes, hunting and fishing licenses and fees. 1. Address the underlying cause and cut carbon pollution 50 percent by 2030. 2. Transition to cleaner, more secure sources of energy like offshore wind, solar power and next-generation biofuels and avoid polluting energy like coal and tar sands oil. 3. Safeguard wildlife and their habitats by promoting climate-smart approaches to conservation. 4. Factor a changing climate in big game plans and management. The National Wildlife Federation is also running radio ads educating sportsmen about climate change’s threat to moose in Maine, Michigan, Minnesota, Montana and New Hampshire. The version running in Maine, Michigan, Minnesota and Montana is available here: http://bit.ly/MooseRadioAd-MT. The New Hampshire ad is available here: http://bit.ly/MooseRadioAd-NH. Get more National Wildlife Federation news at NWF.org/News. The National Wildlife Federation is America’s largest conservation organization inspiring Americans to protect wildlife for our children’s future.